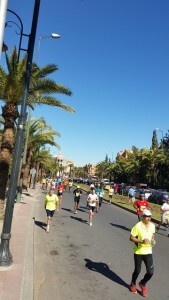 Marrakesh: It was perfect weather this last weekend for the 2016 Marrakesh Marathon. For all you marathoners here is a great event to tick off your bucket list and you get to be in Marrakesh. If running a marathon is not your cup of tea, save your energy for exploring this wonderful UNESCO world heritage city — there is so much to explore: the old medina, Djemaa el-Fna Square, the markets, Koutoubia Mosque, Bahia Palace, Ben Youssef Madrasa… the list goes on and on. All of our Berber Treasures Morocco tours small group tours of Morocco include Marrakesh and of course it is a must see if you choose one of our custom designed private Morocco tours. Email or call us now to discuss your Berber Treasures Morocco Tours itinerary.